My fellow Ulster County Democrats, I am honored to address you tonight. Like all of you, I am deeply concerned about the future of our great democracy. But as we are witnessing with our amazing candidates tonight — what tremendous and exciting opportunities lay ahead for Ulster County to set the stage for what our communities can be. What our great state of New York can be. And I would be humbled to be part of that change as your new Ulster County Sheriff. I have been privileged to meet many of you over the past few months. You know that I have spent most of my adult life in the service of our country and our local community. I wish to continue serving our community as your next Ulster County Sheriff. This race is unique with tremendous responsibilities. Unlike the State Police superintendent appointed by the governor, the Police Commissioner appointed by the Mayor or the Police chief appointed by a town board, the County Sheriff is elected by the people and is responsible to the people of the County. 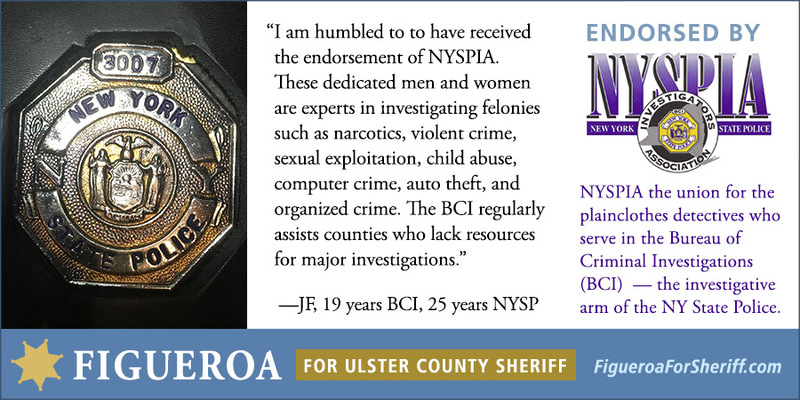 Today I commit to you that if elected Sheriff, I will protect all residents and visitors of Ulster County. No matter your race, gender, religion or political affiliation. The office of sheriff belongs to the people, I share your values and I bring those values to the office. My vision is to build a relationship of mutual respect and trust between law enforcers and the residents that it serves. A relationship that both upholds the law and protects the individual rights of our citizens. A mission that keeps our schools, our streets, our roads, and properties safe. To assure our Sheriff’s department is run efficiently and achieves the highest levels service to its citizens. As a Marine, a Trooper… and a person of color… I know how to bridge the gap between law enforcement and the community it serves. I have managed situations in all aspects of law enforcement. Removing fear is the only way to break down the barriers of mistrust. A plan to deal with the Opioid / Heroin epidemic in a humane way, to get those that want help into rehab before it becomes a criminal justice issue. To frankly discuss discrimination. All people want is to be treated fairly with dignity and respect. I want to assure that women can feel safe to report domestic violence and sexual harassment. I believe in Common sense Gun Laws. I believe in a diverse work force with Women in positions of authority and equal pay. Keeping our citizens safe requires input from all in our community. We need to assure our immigrants that they can contact the Sheriff’s Office with out fear. Everyone in Ulster county needs to be treated fairly and not be deprived of life, liberty, property without due process and equal protection under the law. My fellow Democrats: I have travelled the world and each time I came home, I appreciated how special our country is. We are nation of diversity, a nations of ideas and a nation of laws. This is the time that we must unite and take a stand to preserve our country’s promise. I have taken the oath of office many times in the past; to uphold and protect the constitution of the Unites States. Right now in our own county, we have a tremendous opportunity to step forward to renew what Democrats stand for: opportunity, equal protection under the law, where a community and its protectors truly trust and respect one another. Tonight, I am humbly asking for your trust in my conviction and commitment to make that a reality as your next County Sheriff.